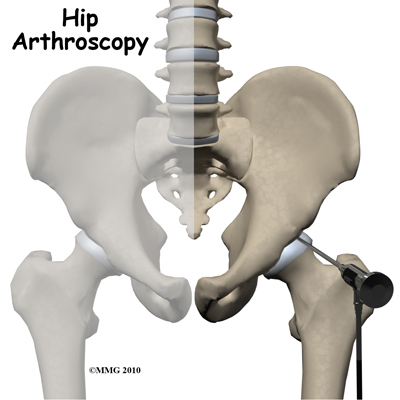 Welcome to Purposed Physical Therapy's resource on hip arthroscopy. A hip arthroscopy is a procedure where a small video camera attached to a fiber-optic lens is inserted into the hip joint to allow a surgeon to see the joint and do work on the joint without making a large incision. Arthroscopy is now used to evaluate and treat orthopedic problems in many different joints of the body. While not as common as arthroscopy of the knee and shoulder, hip arthroscopy is used to evaluate and treat certain problems affecting inside the hip joint and the area just outside the hip joint. What parts of the hip are involved? The hip joint is one of the true ball-and-socket joints of the body. 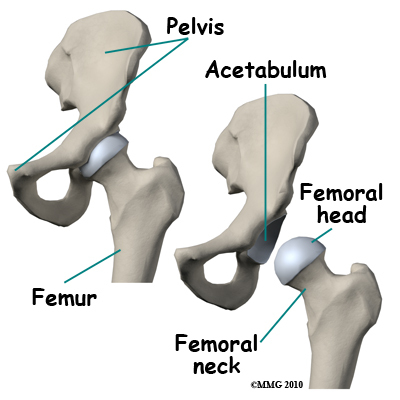 The hip socket is called the acetabulum and forms a deep cup that surrounds the ball of the upper thighbone. The thighbone itself is called the femur, and the ball on the end is called the femoral head. The ball and socket arrangement gives the hip a large amount of motion needed for daily activities such as walking, squatting, and climbing stairs. 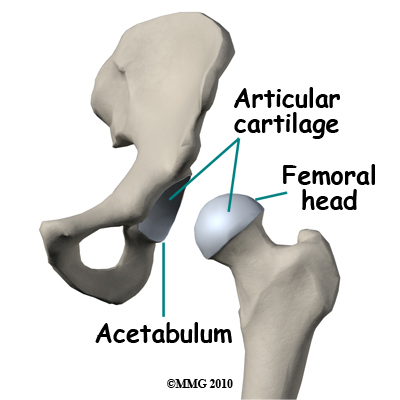 The surfaces of the femoral head and the inside of the acetabulum are covered with articular cartilage. This material is about one-quarter of an inch thick in most large joints. Articular cartilage is a tough, slick material that allows the surfaces to slide against one another without damage. The gluteus maximus is the largest of three gluteal muscles of the buttocks. The gluteus maximus muscle spans the side of the hip and joins to the iliotibial band. The iliotibial band is a long tendon that passes over the bursa on the outside of the greater trochanter. It runs down the side of the thigh and attaches just below the outside edge of the knee. 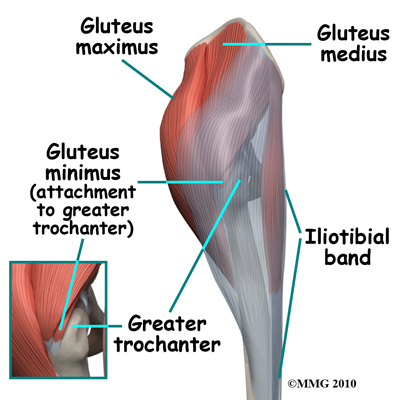 The other two buttocks muscles, the gluteus medius and the gluteus minimus, attach to the greater trochanter. These muscles are known as abductors because they function to pull the lower leg away from the body; a motion that is called abduction. These muscles can be torn where they attach to the greater trochanter causing pain and weakness as well as a snapping sensation. 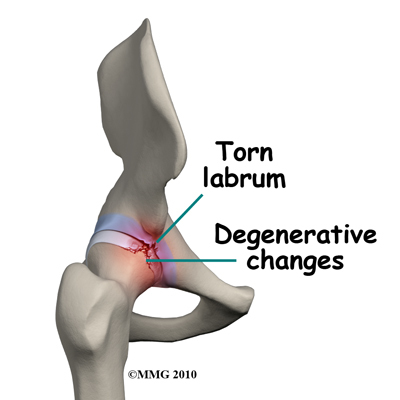 The acetabular labrum is a fibrous rim of cartilage around the hip socket that is important in normal function of the hip. It helps keep the head of the femur (thigh bone) inside the acetabulum (hip socket). It provides stability to the joint. Wherever friction must occur between muscles, tendons, and bones, there is usually a bursa. A bursa is a thin sac of tissue that contains a bit of fluid to lubricate the area where the friction occurs. The bursa is a normal structure, and the body will even produce a bursa in response to friction in an area. 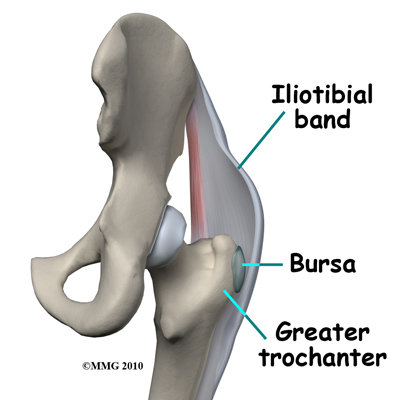 The bursa next to the greater trochanter is called the greater trochanteric bursa. The hip joint is a synovial joint. Synovial joints are enclosed by a ligamentous capsule and contain a fluid, called synovial fluid, that lubricates the joint. The water-tight joint capsule is formed by ligaments, connective tissue and synovial tissue. 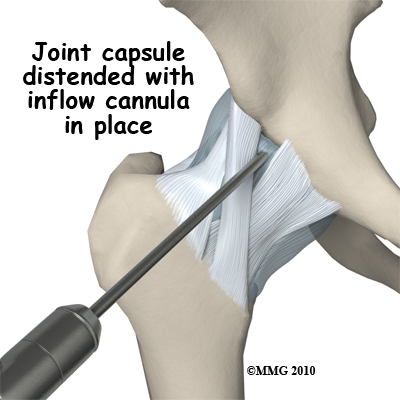 When the joint capsule is filled with sterile saline and is distended, the surgeon can insert the arthroscope into the pocket that is formed, turn on the lights and the camera and see inside the hip joint as if looking into an aquarium. The surgeon can see nearly everything that is inside the hip joint including: (1) the joint surfaces of the femoral head and acetabulum (2) the acetabular labrum and (3) the synovial lining of the joint. The arthroscope can also be inserted into the greater trochanteric bursa. This allows the surgeon to see the attachment of the gluteus medius muscle and the inside of the bursa. When hip arthroscopy first became available it was used primarily to look inside the hip joint and make a diagnosis. Today, hip arthroscopy is used in performing a wide range of different types of surgical procedures on the hip joint including confirming a diagnosis, removing loose bodies, removing or repairing a torn labrum, debriding excess inflamed bursa tissue, repairing a tear in the gluteus medius tendon and fixing fractures of the joint surface. Your surgeon's goal is to fix or improve your problem by performing a suitable surgical procedure; the arthroscope is a tool that improves the surgeon’s ability to perform that procedure with minimal invasiveness. The arthroscope image is magnified and allows the surgeon to see better and clearer, and also allows the surgeon to perform surgery using much smaller incisions. Smaller incisions result in less tissue damage to normal tissue and can shorten the healing process. It should be remembered, however, that the arthroscope is only a tool. The results that you can expect from a hip arthroscopy depend on what is wrong with your hip, what can be done inside your hip to improve the problem and your effort at rehabilitation after the surgery. You will also need to spend time prior to the surgery with a Physical Therapist at Purposed Physical Therapy. Preoperative Physical Therapy allows you to get a head start on your recovery. One purpose of this preoperative visit is to record a baseline of information. Your Physical Therapist will check your current pain levels, and will measure the movement and strength of each hip. It also allows your Physical Therapist to see your natural alignment and ability to perform certain activities such as squatting and walking prior to having your surgery. Observing these things ahead of time can greatly assist your Physical Therapist in prescribing the correct exercises post-surgically that address any alignment issues you may have. This will, in turn, help prevent a recurrence of your problem. A second purpose of the preoperative visit is to prepare you for what you can expect after surgery. Your Physical Therapist will teach you how to walk safely using crutches or a walker and you will begin to learn some of the exercises you will use during your recovery. Before surgery you will be placed under either a general anesthesia or a type of spinal anesthesia. 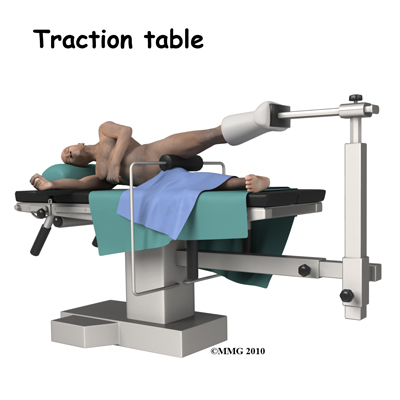 A special operating room table called a traction table will be used. The hip joint is very tight with little space between the ball and the socket. By applying traction, the surgeon is able to increase this space and allow the arthroscope to be inserted into that space. The end of the arthroscope will be moved about in this space to look throughout the joint. Sterile drapes will be placed to create a sterile environment for the surgeon to work. There is a great deal of equipment that surrounds the operating table including the TV screens, cameras, light sources, and surgical instruments. The surgeon begins the operation by making two or three small openings into the hip, called portals. These portals are where the arthroscope and surgical instruments are placed inside the hip. Care is taken to protect the nearby nerves and blood vessels. A small metal or plastic tube (or cannula) will be placed through one of the portals to inflate the hip with sterile saline. The arthroscope is a small metal fiber-optic tube. It is about 1/4 inch in diameter (slightly smaller than a pencil) and about seven inches in length. The fiber-optics inside the metal tube of the arthroscope allow a bright light and TV camera to be connected to the outer end of the arthroscope. The light shines through the fiber-optic tube and into the hip joint. A TV camera is attached to the lens on the outer end of the arthroscope. The TV camera projects the image from inside the hip joint onto a TV screen next to the surgeon. The surgeon actually watches the TV screen (not the hip) while moving the arthroscope to different places inside the hip joint and bursa. Over the years since the invention of the arthroscope, many very specialized instruments have been developed to perform different types of surgery using the arthroscope and to see what is going on while the instruments are being used. Today, many surgical procedures that once required large incisions for the surgeon to see and fix the problem can be done arthroscopically with much smaller incisions. For example, simple removal of a torn labrum or a loose body can be done using two or three small 1/4 inch incisions. More extensive surgical procedures may require larger incisions. Your surgeon may decide during the procedure that the problem requires a more traditional open type operation. If this has been discussed before the operation the surgery may be performed immediately; if it has not been discussed, the arthroscopic procedure will be concluded and another operation at a later date will be planned once your surgeon has discussed with you the details of what was found at the time of the arthroscopy and what more needs to be done. Once the surgical procedure is complete, the arthroscopic portals and surgical incisions are closed with sutures or surgical staples and covered with surgical strips. A large bandage will be applied to your hip. You may be placed in compression stockings, which are like long socks. The compression stockings reduce swelling and help prevent blood clots in the leg. Many surgeons also use pumps on your lower legs over the compression stockings. The pumps perform a similar function to the stockings, but are actively moving the fluid in your lower legs. You will only wear these pumps when you are not moving around. The stockings, however, should be worn at all times. Once all the bandages have been placed, you will be taken to the recovery room. Hip arthroscopy is usually done on an outpatient basis meaning that patients go home the same day as the surgery. More complex reconstructions that require larger incisions and surgery that alters bone may require a short stay in the hospital to control pain more aggressively and monitor the situation carefully. In this case you will begin Physical Therapy while in the hospital. Crutches are commonly used after hip arthroscopy and the Physical Therapist will show you how to use your crutches on both level ground and also while doing stairs. You will need to follow your surgeon's instructions about how much weight to place on your foot while standing or walking. How much weight your surgeon would like you to put on your surgical side depends on what your surgeon has done inside your joint. Every surgery is different. Crutches may only be needed for one to two days after simple procedures, but should be used until your surgeon says you can fully weight bear, and until you can walk virtually without a limp. Even one crutch, used on the opposite side to your injury, can be used to provide some support and allow you to avoid walking with a compensatory gait post-surgically. It is important to avoid doing too much, too quickly. You will be instructed to use a cold pack on the hip and to keep your leg elevated and supported while sitting or laying both in the hospital and when you go home. You will also be instructed to perform simple ankle circle exercises and ankle pumping exercises to assist with moving swelling from your leg and preventing the blood in your legs from clotting. Thrombophlebitis, sometimes called deep venous thrombosis (DVT), can occur after any operation, but is more likely to occur following surgery on the hip, pelvis, or knee. DVT occurs when blood clots form in the large veins of the leg. This may cause the leg to swell and become warm to the touch and painful. 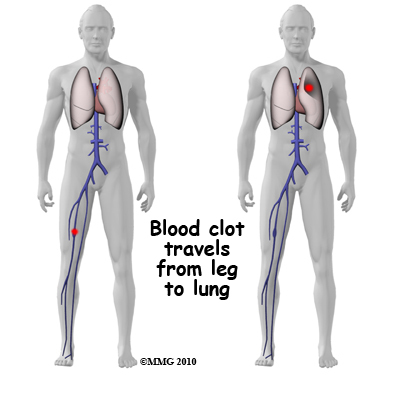 If the blood clots in the veins break apart, they can travel to the lungs, where they lodge in the capillaries and cut off the blood supply to a portion of the lung. This is called a pulmonary embolism. (Pulmonary means lung, and embolism refers to a fragment of something traveling through the vascular system.) Surgeons take preventing DVT very seriously. There are many ways to reduce the risk of DVT, but probably the most effective way is to get you moving as soon as possible after surgery. Moving means getting you up out of bed to sit in a chair and to walk as soon as you are able, but it also includes having you perform ankle circles and ankle pumping exercises while lying down or sitting, which also helps to keep the fluid moving in your legs. Two other commonly used preventative measures include pressure stockings, as described above, and medications that thin the blood and prevent blood clots from forming. Following hip arthroscopy, it is possible that a postoperative infection may occur. This is very uncommon and happens in less than 1% of cases but it can happen. You may experience increased pain, swelling, fever and redness, or drainage from the incisions. You should alert your surgeon if you think you are developing an infection. Infections are of two types: superficial or deep. A superficial infection may occur in the skin around the incisions or portals. A superficial infection does not extend into the joint and can usually be treated with antibiotics alone. If the hip joint itself becomes infected, this is a serious complication and will require antibiotics and possibly another surgical procedure to drain the infection. Many of the instruments used by the surgeon to perform hip arthroscopy are small and fragile. These instruments can be broken resulting in a piece of the instrument floating inside of the joint. The broken piece is usually easily located and removed, but this may cause the operation to last longer than planned. Fortunately there is usually no damage to the hip joint due to the breakage. Different types of surgical devices (screws, pins, and suture anchors) are used to hold tissue in place during and after arthroscopy. These devices, unfortunately, can also cause problems. If one breaks, the free-floating piece may damage other parts inside the hip joint, particularly the articular cartilage. The end of the tissue anchor may poke too far through tissue causing it to rub and irritate nearby tissues. A second surgery may be needed to remove the device or to fix problems with these devices. Not everyone gets quickly back to routine activities after hip arthroscopy. Due to the arthroscope allowing surgeons to use smaller incisions than in the past, many patients mistakenly believe that less surgery was necessary. This is not always true. The arthroscope allows surgeons to do a great deal of reconstructive surgery inside the hip without making large incisions. How fast you recover from hip arthroscopy depends on what type of surgery was done inside your hip, as well as on how well you do with your rehabilitation. Simple problems that require simple procedures using the arthroscope generally get better faster. Patients with extensive damage to the hip articular cartilage tend to require more complex and extensive surgical procedures that take longer to heal and require longer rehabilitation. You should discuss your individual injury with your surgeon and make sure that you have a realistic expectation of what to expect following arthroscopic hip surgery. After hip arthroscopy rehabilitation at Purposed Physical Therapy should begin as soon as possible. There are a few cases where your surgeon may delay a start in your therapy because they want the tissues to heal with rest before any further stress is placed on the hip. Often therapy begins before you are even allowed to fully weight bear. In other cases, rehabilitation will not be recommended until full or nearly full weight bearing begins. Each surgeon will set his or her own specific restrictions based on what was done during the surgical procedure, their personal experience, and whether your tissues are healing as expected. Generally speaking, the more complex the surgery the more involved and prolonged your rehabilitation program will be. If you are still using crutches by the time we first see you at Purposed Physical Therapy, your Physical Therapist will ensure you are using the crutches safely, properly, and confidently and that you are abiding by your weight bearing restrictions. We will also ensure that you can safely use your crutches on stairs. If you are no longer using crutches, or once you no longer need them, your Physical Therapist will focus on normal gait re-education so you are putting only the necessary forces through the surgical side with each step, and are not compensating in any way. As mentioned above, until you are able to walk without a significant limp, we recommend that you continue to use your crutches, or at least one crutch or a cane/walking stick. Improper gait can lead to a host of other pains in the knee, hip and back so it is prudent to use a walking aid until near normal walking can be achieved. Your Purposed Physical Therapy Physical Therapist will advise you regarding the appropriate time for you to be walking without any walking aid at all. During your first few appointments at Purposed Physical Therapy your Physical Therapist will focus on relieving the pain and inflammation from the surgical procedure itself. We may use modalities such as ice, heat, ultrasound, or electrical current to assist with decreasing any pain or swelling you have around the surgical site or anywhere down the extremity. In addition, your Physical Therapist may massage your leg and ankle to improve circulation and help decrease your pain. The next part of our treatment will focus on regaining the range of motion in your hip. Your Physical Therapist at Purposed Physical Therapy will prescribe a series of stretching and strengthening exercises that you will practice in the clinic and also learn to do as part of a home exercise program. Range of motion in the hip generally comes back very quickly after an arthroscopic surgery, but it still depends on what your surgeon has done inside your joint. Most often patients find their range of motion improves slightly from prior to surgery because their surgeon has cleaned up the joint. You may experience a small amount of discomfort at the end ranges of motion initially, but it is still important to perform the range of motion exercises that your therapist prescribes because moving the joint also helps to move the swelling, get fresh blood to the healing area, and provide nutrition to the surface of the joint. Only mild discomfort, however, is permissible. Any sharp or moderate discomfort should be heeded. An exercise bike at this stage is very useful to assist in gaining back the hip flexion and extension range of motion. Even if you are unable to fully rotate the pedals of the bike it is still encouraged as performing the back and forth motion forces fluid through the joint and greatly assists the healing process. If necessary your Physical Therapist will mobilize your hip joint. This hands-on technique encourages the hip to move gradually into its normal range of motion. Mobilization of the hip may be combined with assisted stretching of any tight muscles around the surgical site. At Purposed Physical Therapy we also highly recommend maintaining the rest of your body’s fitness with regular exercise while your hip is healing. This can begin very early post-surgically. You can use an upper body bike if you are non-weight bearing or may even be allowed to do non-weight bearing exercises in a pool. A stationary bike is often the best cardiovascular activity once weight bearing begins and your range of motion allows it. Weights for the upper extremities and other leg are also strongly encouraged. Your Physical Therapist at Purposed Physical Therapy can provide a program for you to maintain your general fitness while you recover from your surgery. As soon as possible your Physical Therapist will prescribe strengthening exercises. These exercises will focus on the muscles of your hip and thigh but will also include some exercises for your back as it plays a large supporting role for your hips. Exercises that involve the entire lower limb, such as squats, will also be given. It is important for you to perform weight bearing exercises as soon as you are able to in order to build up the muscles in a functional position, such as standing. Exercises that work the muscles while in standing most effectively assist with daily activities such as walking and stair climbing. Other exercises in sitting or lying, however, may also be prescribed. Exercises in these positions can be excellent in allowing you to target specific muscles around the hip, such as the gluteals, without causing you any discomfort from too much body weight being on the hip. Your therapist may use an electrical muscle stimulator to assist your muscles in contracting as you do your exercises; this will help you to more rapidly gain your strength back. Exercises may also include the use of Theraband or weights to provide some added resistance for your hip and lower extremity. If you have access to a pool, your therapist may suggest you go to the pool to do your exercises. The buoyancy of the water along with the warmth of the water can assist greatly in providing comfort to the hip joint and often allows your exercises to be done more easily with less discomfort. As a result of any injury, the receptors in your joints and ligaments that assist with balance and proprioception (the ability to know where your body is without looking at it) decline in function. A period of immobility and reduced weight bearing will add to this decline. If your balance and proprioception has declined, your joints and your limb as a whole will not be as efficient in their functioning and the decline may also contribute to further injury in the future. As a final component of our treatment your Physical Therapist at Purposed Physical Therapy will prescribe exercises for you to regain this balance and proprioception. These exercises might include activities such as standing on one foot or balancing on an unstable surface such as a wobbly board or a soft plastic disc. Advanced exercises will include agility type exercises such as light hopping or moving side to side. As your range of motion, strength, and proprioception improve, your therapist will advance your exercises to ensure your rehabilitation is progressing as quickly as your body allows. As soon as it is safe to do so, your Physical Therapist will add more aggressive exercises such as jumping, hopping, and running, or exercises that mimic the sports or recreational activities that you enjoy participating in. During all of your exercises you therapist will pay particular attention to your technique to ensure that you are not using any compensatory patterns or are developing bad habits in regards to how you use your hip and lower extremity. Enduring pain in your hip for years, months, or even just weeks generally causes you to use your hip and lower extremity in a pattern that avoids or limits your pain, but that is not efficient for a normal hip. If you do not pay close attention to how you use your joint and limb post-surgically these patterns often continue to occur once the source of your pain has been eliminated by the arthroscopic surgery. Your Physical Therapist at Purposed Physical Therapy will be crucial to providing you with feedback regarding correcting these patterns and developing new, efficient patterns during your daily activities. Today, the arthroscope is used to perform quite complicated major reconstructive surgery using very small incisions. Remember, however, that just because you have small incisions on the outside, there may be a great deal of healing tissue on the inside of the hip joint. If you have had major reconstructive surgery, you should expect full recovery to take several months. Generally the rehabilitation after arthroscopic hip surgery responds very well to the Physical Therapy we provide at Purposed Physical Therapy. If for some reason, however, your pain continues longer than it should or therapy is not progressing as your Physical Therapist would expect, we will ask you to follow-up with your surgeon to confirm that the hip is tolerating the rehabilitation well and ensure that there are no complications that may be impeding your recovery.